(P1) This bloodsucker might not be your best friend, but it loves you. The mosquito, Aedes aegypti, is causing widespread fear in Brazil where it is spreading the Zika virus that has been linked to thousands of babies being born with birth defects. So what do we know about it? (P2) This is not some jungle dwelling insect that rarely comes into contact with people. It is one of those animals, like cockroaches, pigeons, and urban foxes, that thrives in built-up areas. (P3) It does not need natural water sources to breed as it can lay eggs in the small and plentiful pools of stagnant water, such as gutters or flower pots, found in cities. (P4) Cities like Singapore have big problems with the mosquito. Prof Uriel Kitron, from Emory University, said: “Aegypti is really adapted well to urban areas. (P6) There’s also plenty of food – us. (P7) Zika is currently getting all the attention, but Aedes aegypti has long been known as the yellow fever mosquito. Yellow fever is a viral disease that can cause jaundice, bleeding, and multiple organ failures in some cases. 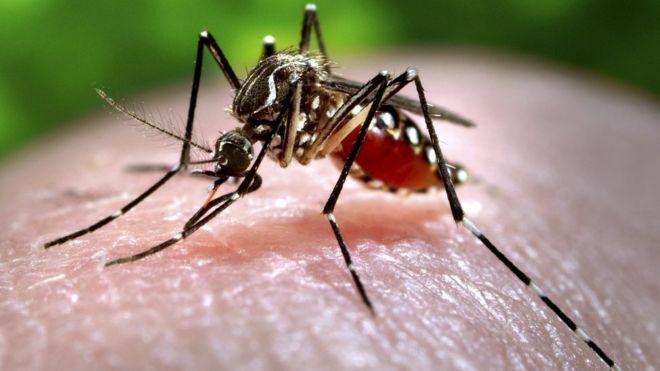 390 million people are infected with the dengue virus each year, largely as a result of bites from Aedes aegypti. (p8) Chikungunya, another virus causing alarm as it expands around the world, is also spread by the insects. They do it by biting someone who is infected and then biting someone else. What can be done to prevent the Zika and Chikungunya viruses? Should governments have programs to control mosquitos? Why or why not? Do you use mosquito repellant? Why or why not? What’s another name for the mosquito mentioned in the article? Which city has a huge problem with mosquitos? How many humans are contaminated with dengue fever per year? How do mosquitos spread the viruses?